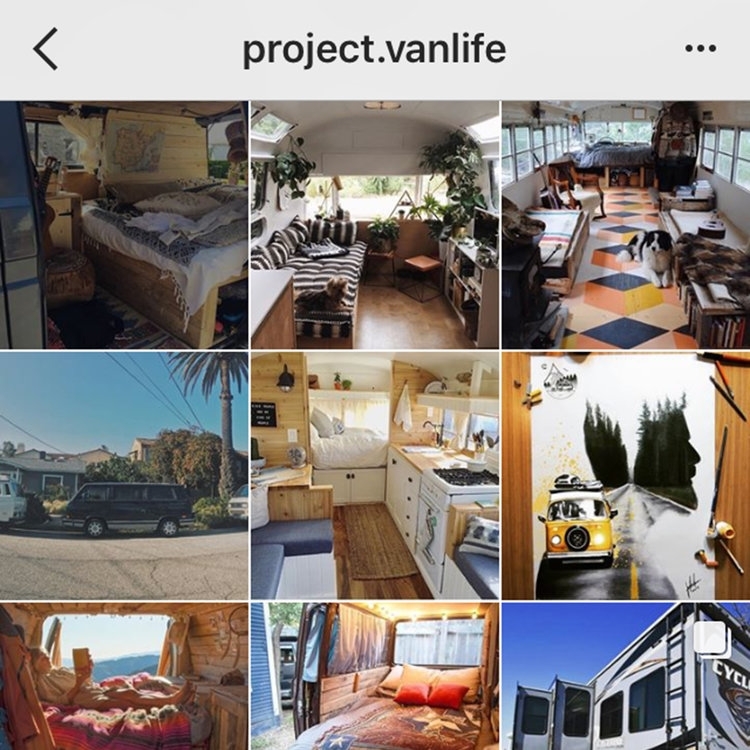 So you wanna live the vanlife but you have a super tiny budget and you need a quick turnaround? 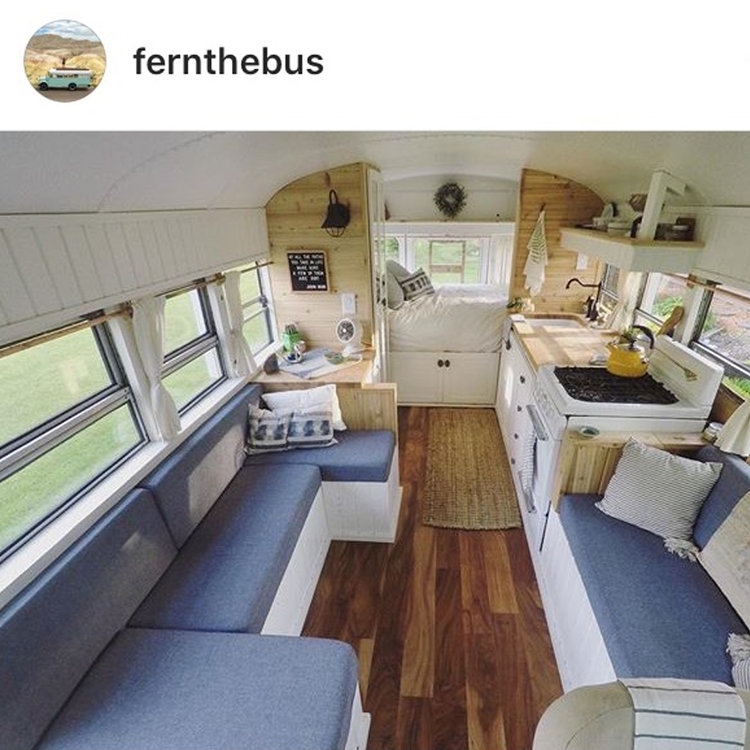 And on top of that, you don't have a ton of tools or experience with this type of campervan conversion? We bought a van (that was in dire need of some TLC) for cheap, and transformed it into a livable home with all the campervan essentials in less than one week of working time. Plus, this was our very first time doing anything like this and we had very few tools to use. In this article, we have laid out exactly how we built our DIY campervan fast and cheap so you can follow in our footsteps. DIY Campervan Table of Contents: If you know what you are looking for, click the link below and jump down the page. 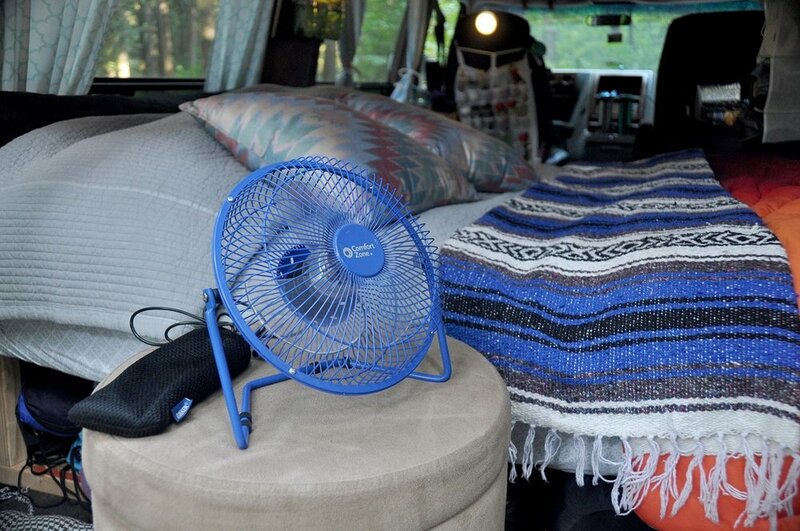 Step 10: Make it feel like "home"
How much does daily van life cost? Pin this article for later. Share it on Pinterest! 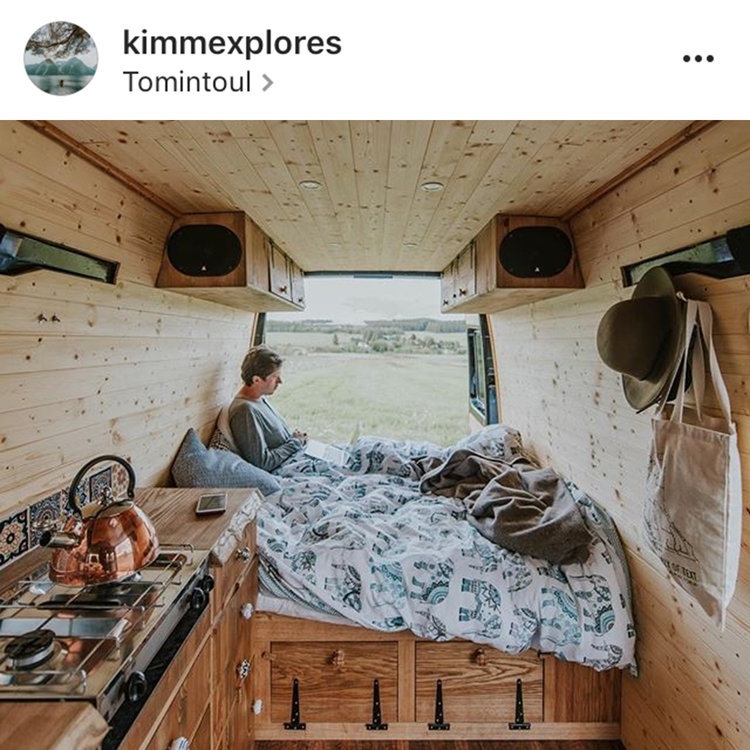 You can scroll through Instagram profiles of people who've spent years and thousands upon thousands of dollars to create super luxurious campvervan conversions. They are frickin' awesome. Take a look at some of these, and you'll be floored by how people can transform a tiny space when given enough time and money. We were incredible happy with how it turned out and can't think of much we would change with the time and budget constraints we had. Below is our finished product: Our beloved "Vinny the Van". Not as fancy as those pictured above, but not too shabby! We had an incredible summer traveling with Vinny. We made it through 8 western states and even up to Canada. 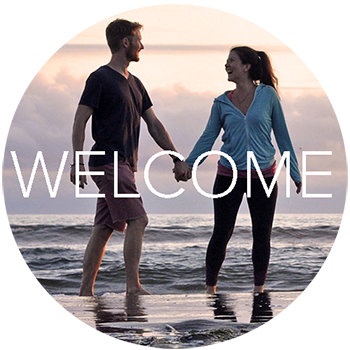 If you want more inspiration to build your own campervan, take a peak at our West Coast Campervan Trip Video below. 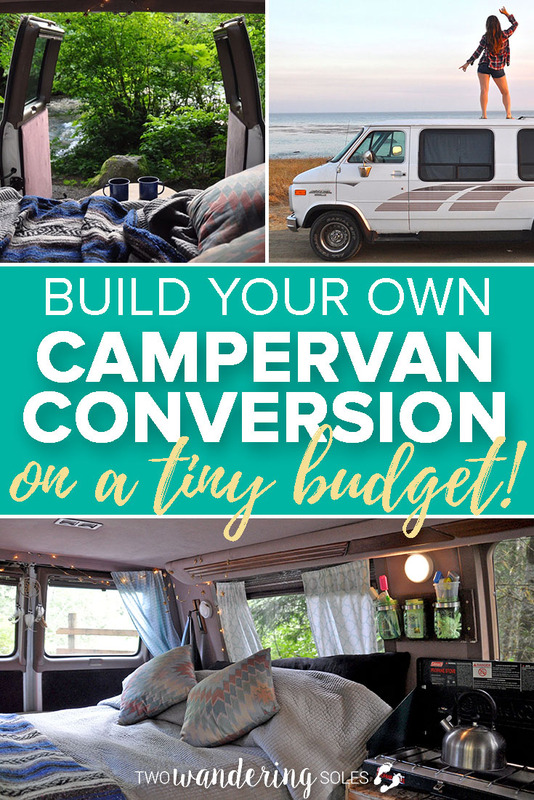 For those of you who, like us, don't have tons of time or money, we are here to share exactly how you can make your own DIY campervan from square one in less than a week and on a tiny budget. We're also going to break down exactly how much each of these steps cost us so you have an idea of what to expect. 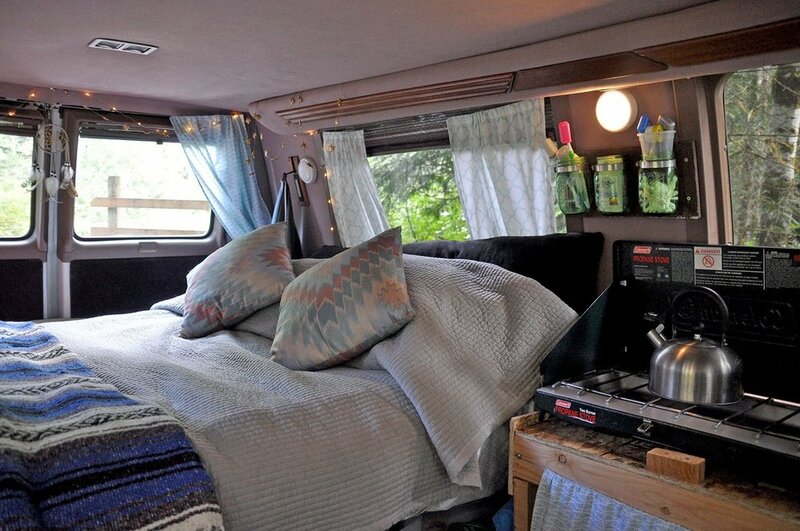 If you have ever thought of doing a campervan conversion (or know of someone who's thinking of making the plunge), you won't want to miss this! Well duh, right? Hold up for a minute... there's a little more to buying a van than just shelling out some cash. Don't be afraid to widen your search a little bit, too. We ended up driving about 3 hours from where we live to pick up our van because the prices are super high in our area. We used Craigslist to find our van, but reaching out to friends and family is a good idea, too. You may be surprised at the connections you have. Mileage and age of the car are both obvious things to consider, but here are a few other things to think about when buying a used van. Tires: How are the treads? Will they need to be replaced? If so, use this as a way to negotiate price. Air conditioning and Heat: Do they work well? Living in a space without AC or heat can be very uncomfortable and fixing these systems can be difficult and expensive. Clearance: Check out how low the van is to the ground. There are some campsites and "off the beaten path" roads that will be difficult to navigate if your vehicle has low clearance. This is a good thing to keep in mind when purchasing a campervan or RV. Noises: Listen to the engine as it's shifting gears. Any unknown noises can be a sign of a problem that'll need to be fixed. Leaks: If the van has been sitting for a while, look underneath and search for any signs of leaks. Some leaks are easily fixed, but others can be expensive. You'll want to know what you're getting into. Brakes: Make sure the pads aren't too worn down and that they don't squeak when pressure is applied. 4WD vs. RWD: This isn't a make or break, but it's a good thing to know before buying. RWD will not be the best come wintertime (if you're in places where it will snow). That said, our van was a rear wheel drive and it made it up many mountain passes in the summertime. How much does buying a used van cost? We paid $2,000 for our used van. 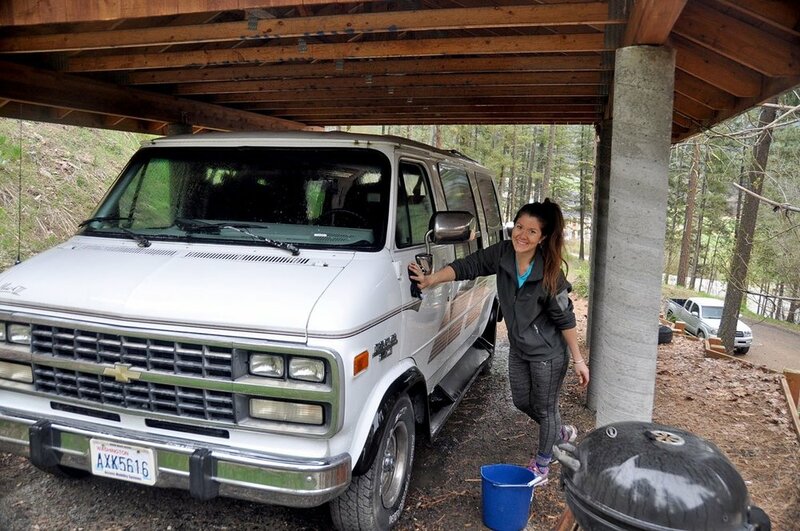 It is a 1994 Chevy G20 Van with 85,000 miles (super low!). We also had to pay $310 for the title transfer and registration (Washington has notoriously high fees for this service). As mentioned above, the market for this type of van will vary depending on which area you're searching. Prices may be a bit higher or lower, but this should give you an idea to start with. Chances are that if you are buying an inexpensive used van, there will be some initial work to do to get it all cleaned out. Tip: Try selling any valuable items on Craigslist - you never know what people around you may be searching for! We used Arm & Hammer carpet cleaner, a vacuum and a hard bristle brush to get the smells and grime out of the carpet. Then we used Simple Green to deep clean all the van's hard surfaces. We bought a small air freshener and left the doors open for several hours, and it smelled brand new! How much did the gutting and cleaning cost? We bought a couple cleaning products, totaling $7.83, but since we sold the wheelchair lift and bench seat, we actually made back some money here. This may not be the case for everyone though. To give you a better estimate, we did not take into account the money we earned on these sales. The next step is to measure everything in your car: length, width and height obviously, but also take measurements of the wheel wells and the windows. Also, many cars bow out slightly so the width will vary from the floor, to the center, to the ceiling. Getting all the measurements will the next steps as simple as possible. Start drawing out some basic plans using the measurements you took in Step #3. This is where you'll get to work with your hands (and get them dirty, if you're doing it right!). With the measurements of the van, we created a bed platform using plywood, 2x4's and 2x6's. Ben also made a kitchen counter that holds a stove, cutting boards and our functional sink. How much did our campervan bed platform cost? We had some wood laying around our house, but we paid about $35 for all the plywood and 2x4's at Home Depot. Also, we were lucky enough that a friend had a full mattress she wanted to get rid of, so that part was free for us. Tip: If you can't find a real mattress that's in your budget, you could always look for futon mattresses or thick foam padding. We had to come up with a custom plan for the bed frame to fit exactly in our car. Once we had the plans and the lumber, Ben measured, cut and assembled the bed frame in about 4 hours. 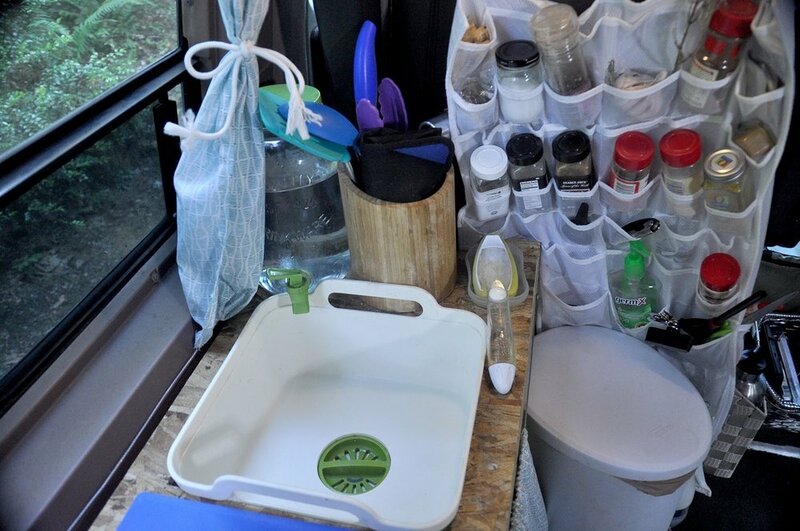 We love to cook, so having a kitchen -- however tiny -- inside our campervan was a huge plus. We (aka Ben) built a simple countertop that held a Coleman 2-burner stove, a small cutting board, a working sink, and a water container. Plus, there's plenty of storage space below! 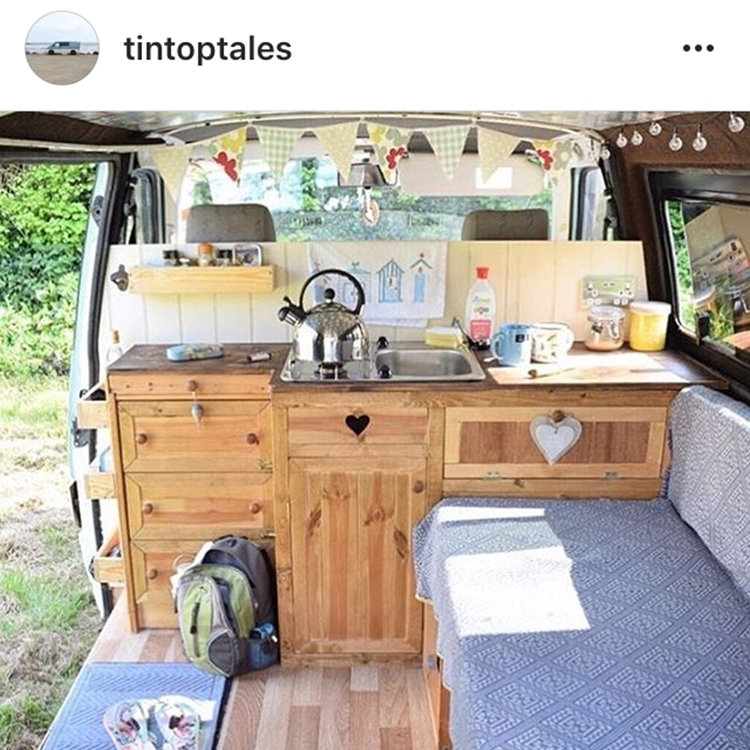 How much did our DIY campervan kitchen cost? The wooden kitchen counter Ben built was made out of plywood and 2x4's. The lumber cost about $15 from Home Depot. The coleman stove was about $35 and the kitchen sink was about $23. We put a lot less thought into the kitchen counter compared to the bed frame, because it basically is a flat table with four legs. The only tricky part was getting the sink hole to fit the sink nice and snug. in total, it took about 2 hours. Take a look at our step by step tutorial on how to make a campervan kitchen. After a bit of trial and error, we kind of perfected the process and we have put together a step-by-step DIY tutorial so you can make your own campervan curtains too! 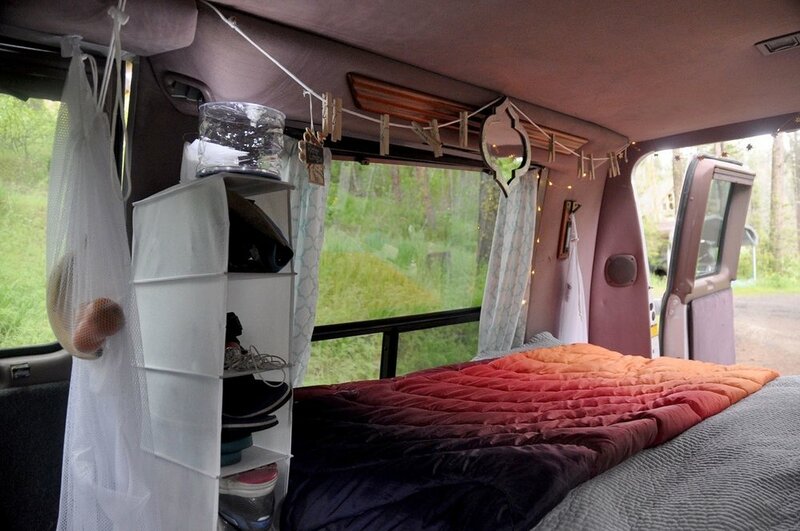 How much did our DIY campervan curtains cost? With the thrift store sheets, thread, picture wire, screws and velcro, we spent a total of $26 for all our curtains. This cost will be higher if you get your fabric from a craft store. 1. How will we get power to charge your electronics in the van? Also, we always travel with our Anker external battery pack to charge items like our phones, GoPro and portable fans. This baby has 7 charges in it! If you have more time and a higher budget, why not consider adding solar panels to your campervan! 2. How will you light your campervan at night? We bought a pack of battery-powered push lights that lasted 3 months and are still going strong. We have a solar powered lantern, Luci, that we left on the dashboard while we were driving. It inflates and gives off tons of light at night. 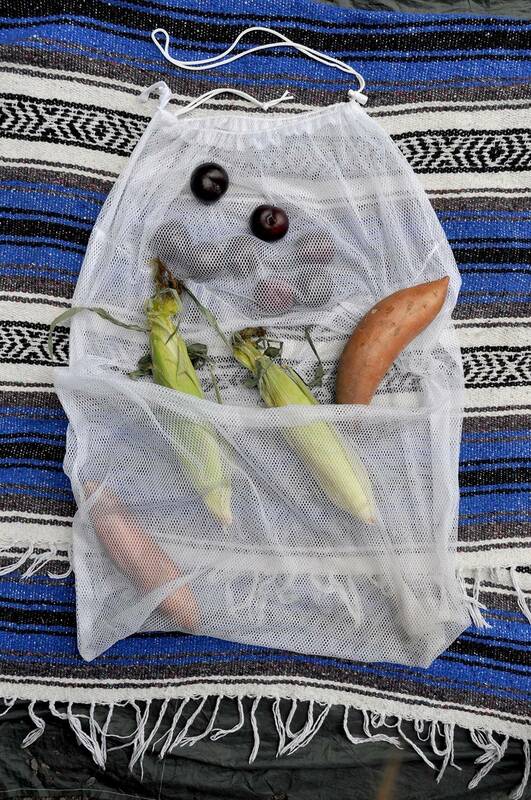 Perfect for the campervan and brining on any backcountry trips we did along the way. 3. How will you wash clothes in your campervan? Over our 3-month road trip, we went to 1 laundromat and washed clothes at a few friends' houses. Most often though, we washed our clothes by hand. We either washed them in our sink, which conveniently has a drain stopper, or we took them into restrooms when we showered and washed them then. We use Dr. Bronners as laundry detergent and dish soap. It has tons of uses, is biodegradable and lasts a super long time. We made a laundry line by stringing up a clothesline and fastening it to the ceiling. We bought clothespins to secure our clothes. This worked wonderfully because we could wash a few items in the morning and they'd be dry before evening. USB fan: At night, we set this beside us and plugged it into our Anker charger. It would run all night and keep us cool. Chargeable fan: We had a small handheld fan that is more portable and if charged, doesn't need to be plugged in. We found that it didn't last as long though, so it was nice to have both as backups. Check out our ultimate campervan packing list for even more ideas of what to bring. 1. Underneath the bed is a great spot for clothes, camp chairs and all other big things. We used the containers from a 3-tiered drawer to store toiletries and pantry items. We used one large but shallow plastic container (minus the lid) to keep our clothes. 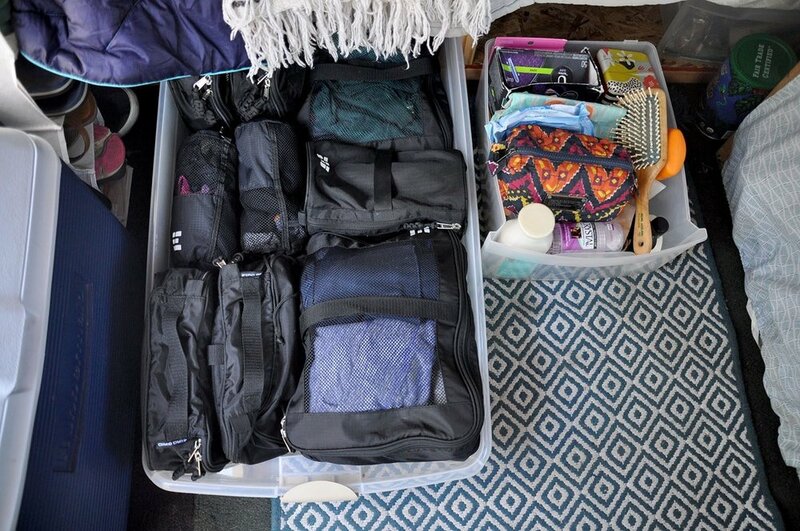 We put all of our clothes into packing cubes first to keep them better organized and compressed, then placed them into the container for easy access. 2. Use a behind-the-door-organizer to hold kitchen supplies, like spices and oil. Hanging this on the back of the driver's seat will maximize your space. 3. Make the most of your vertical space. We hung a laundry bag for dirty clothes and hung a shoe rack from our ceiling. Then I made a horizontal cut in one side of the bag near the middle. Lately, we hung it from the van's ceiling. It's as simple as that! We were careful not to put too many vegetables or fruit inside at once so that it didn't tear, but it was a nice place to store fresh produce! This was the step I was most excited about, but Ben kept telling me to wait until everything else was done. And he was right, of course. Since we were working on a small budget, we frequented the thrift stores near us to find lots of little touches that make our van feel like home. One of my favorite projects was making a place to store our toothbrushes and other odds and ends using Mason jars, an old scrap of wood and hose clamps. You can make this fun and practical addition in less than 20 minutes! Simply use screws to attach the hose clamps around the necks of the Mason jars to the wood (measure first so it fits the jars and inside your campervan). Make sure they're secure and you're all done! Start small in this category, because as we've learned, keeping it simple and uncluttered will make it feel bigger and more like home. 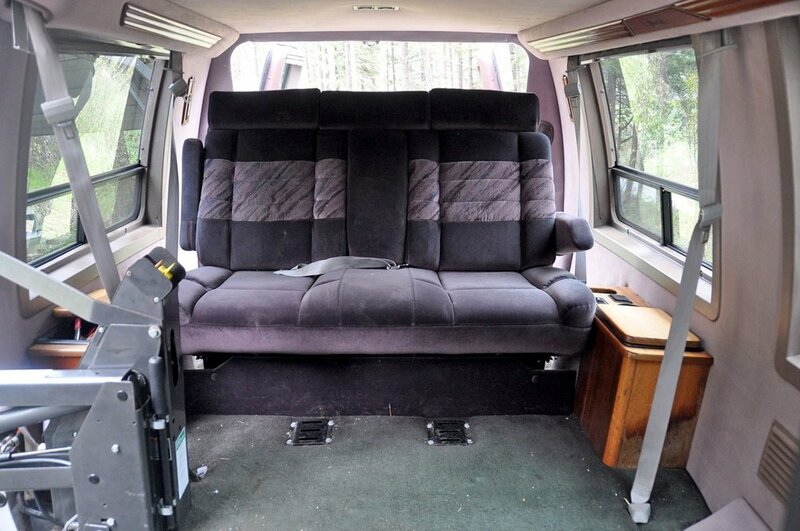 What products do we recommend for a campervan conversion? Campervan kitchen sink - This is the perfect size for what we needed and has a stopper drain. 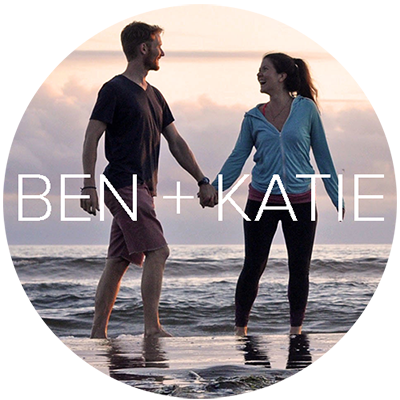 We bought it online at Bed, Bath and Beyond, but you can find it on Amazon too. Coleman Stove - When it comes to camping stoves, you can't get better than a Coleman 2-burner stove. This stove make it easy to cook inside (with the windows open) or move it to a campground picnic table. Make sure to pick up the portable propane tanks. Hanging shoe storage - Get some use out of your vertical space in your van and hang one of these bad boys from the ceiling so you can easily store shoes or other supplies. Behind the door organizer - Hanging behind the driver's seat right next to "kitchen" makes this convenient for spices and oils. It's a great way to stay organized and make use of vertical space. Ottoman with storage - Doubling as a coffee table, this ottoman comes in handy to store jackets, blankets and other puffy gear. 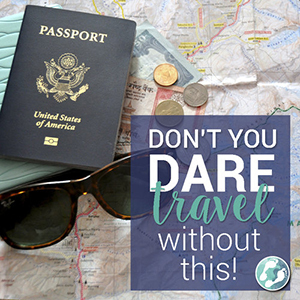 Packing cubes - We never leave home without them. In the van, you'll have to keep things organized and packing cubes work the best to keep your clothes compact and in one place. Trashcan - You will definitely want a trashcan with a lid. Trust us. Choose a small trashcan so it doesn't take up much space, and you can use reuse plastic bags from the grocery store as garbage bags. Also, you'll want to empty it frequently to prevent your van from smelling, so the small size helps you keep on top of this. Tip #1: We secured our trashcan to the kitchen counter using a bungee cord so it didn't move around while we were on the road. 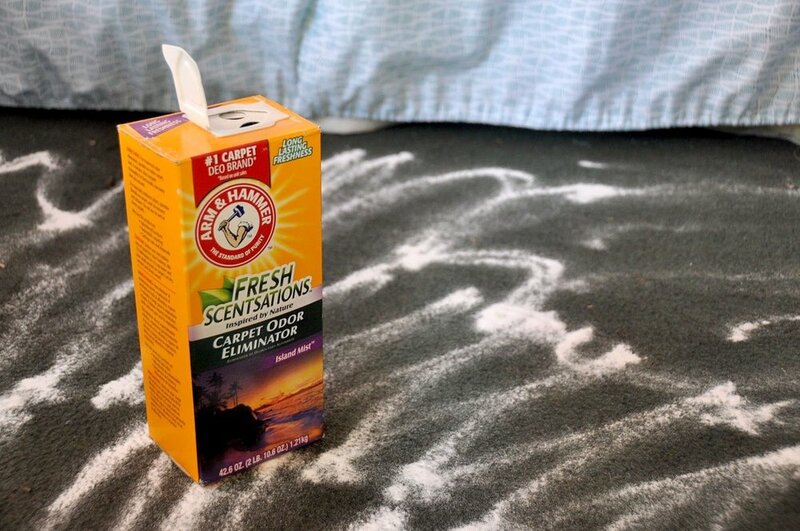 Tip #2: If you are concerned about your trashcan smelling up your tiny home, sprinkle some baking soda in the bottom of the trash can. 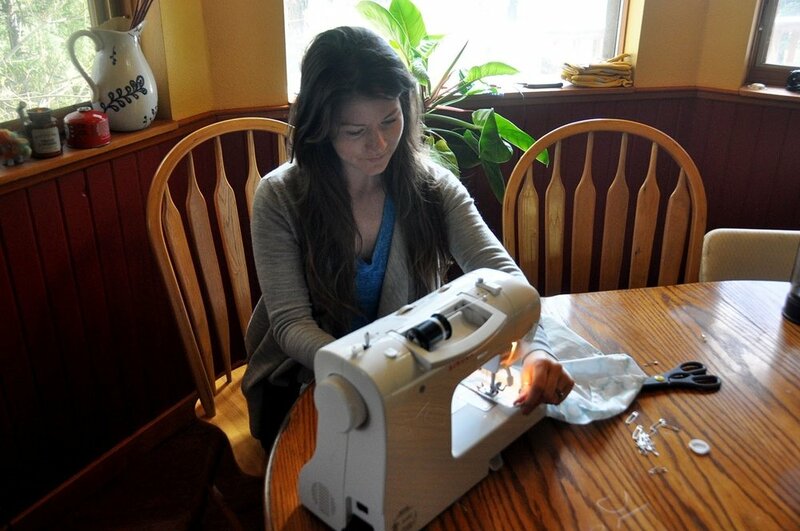 You can also keep a dryer sheet in the bottom before lining it with a plastic bag. By now, you might be trying to tally up all our costs to get an idea of the grand total. Don't worry, we'll tell you how much it all added up to so you don't have to strain your brain. Our grand total for the van AND everything it took to convert it into a livable space adds up to $2,900.96. Not too shabby, huh? While buying a new camper or doing a "fancy" conversion can cost a hefty sum, it certainly is possible to live the van life on a small budget. Now you know how to convert your campervan, all you need is a travel partner. But before you hit the road, be sure to run these questions by that special someone to avoid complete breakdowns. 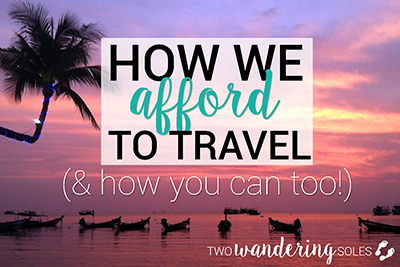 We kept track of every single expense while we were on the road, from gas, to ice, to coffee. 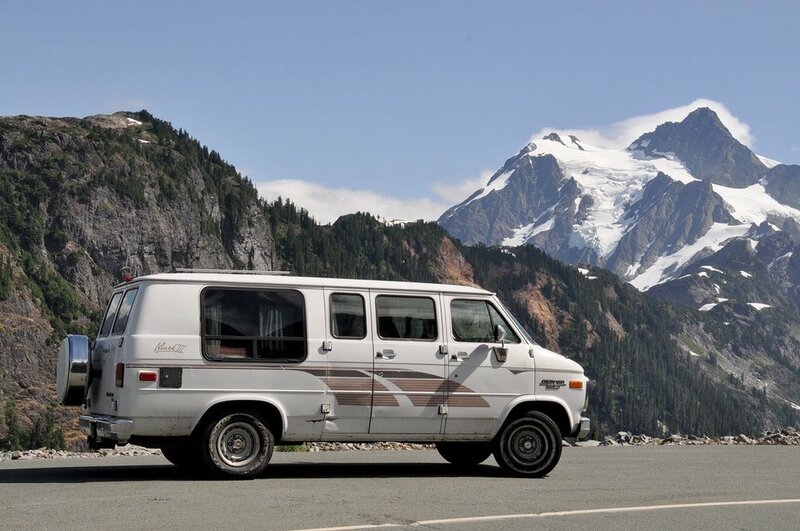 In this article we share those costs and the breakdown of all our expenses on the road soon so you can get an idea of what daily van life costs. Are you planning on building a campervan by yourself? How did you like the article? What questions do you still have? Let us know in the comment below and we'll get back to you!